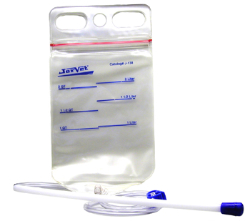 An easy-to-use three quart, clear plastic feeding bag that is conveniently calibrated for proper dosing. Contains a 5-inch filler port with a locking seal for easy filling and closing. Allows for mixing without waste and accommodates the required volume of most oral calf medications.